The 590B Densimeter is a multipurpose instrument capable of quick, accurate estimations of stallion sperm concentration and/or Foal IgG antibody levels. Each Densimeter kit is pre-loaded with the calibration for the specified operation. The 590B Densimeter can hold two calibrations at a time and additional calibrations may be purchased and loaded as needed. This Densimeter also includes a built-in function to directly displays the optical transmission percentage of the sample. 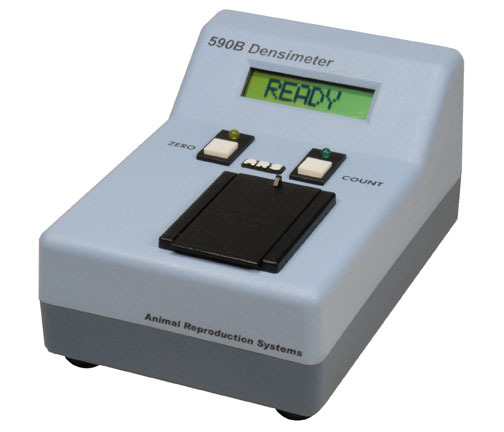 Alternate species calibrations are available for the 590B Densimeter to measure Bull, Boar, Canine, Rooster, and Turkey.sperm concentration. The small size of the 590B Densimeter, approximately 7" x 5" x 3.5", and built-in battery charger make this an ideal device for mobile operations. The internal optical system is identical to the larger ARS Densimeters and provides the same accuracy and stability. The 590B Densimeter performs an automatic calibration before each test, eliminating the need for any additional calibration procedures. All 590B kits includes a universal power supply (120V / 240V operation), instruction manual, required peripheral equipment, alternate calibration loader CD, and a copy of ARS's publication "Techniques in Equine Reproduction". An adapter kit for foreign users is available and must be purchased separately.